Why Are There Puddles Around Your Foundation? Standing water may develop around your home’s foundation if you don’t have an adequate storm drainage system consisting of drainage pipes, catch basins, a sump pump, and a French drain installation near San Antonio . Comprehensive drainage correction, combined with exterior and interior basement waterproofing, can prevent serious structural damage to your home. 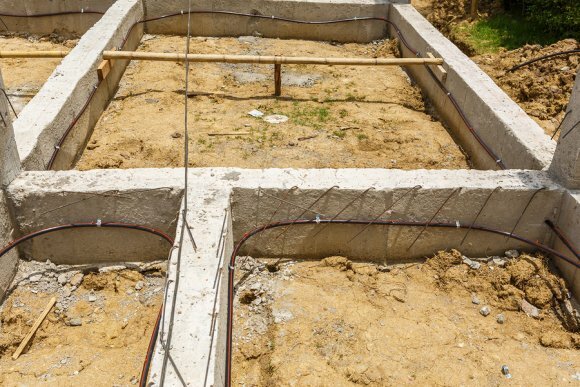 Without proper drainage correction, you may be on the hook for costly foundation repairs. If you notice puddles around our home’s foundation, you should call a general contractor for an inspection. The soil under your foundation may have eroded over time. Your downspouts may be spilling out too much water too close to the foundation. Your home’s gutters may be clogged with leaves, blocking the flow of storm water and causing it to divert to unwanted areas of your home. Your gutters could also be improperly pitched or an inappropriate size for your home’s needs. Your contractor will determine the source of the standing water around your foundation. He can then offer solutions, such as foundation repair, waterproofing your basement, drainage correction, a French drain installation, re-grading the ground around your foundation, and repairing or replacing storm drainage systems. MitchCo Foundation Repair and Drainage Specialists. © 2019 Professional Foundation Repair | San Antonio | All Rights Reserved.